The mortar is a boul, typically made o haird wid, ceramic or stane. 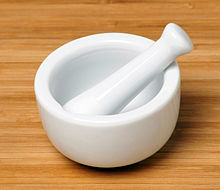 The pestle is a hivy club-shaped object, the end o which is uised for crushin an grindin. The substance tae be groond is placed in the mortar an groond, crushed or mixed wi the pestle. This page wis last eeditit on 15 Februar 2014, at 17:35.